eing so caught up with work, maintaining this blog, and trying to save-up for next generation gaming consoles, I have lost track of reading manga…and that is a sad thing to say at the least. While a lot of people I know read “scanlations” and digital copies, I prefer to buy and collect. Currently I own over 150 books from a variety of series, only nine of which are fully completed. Nothing really has prompted me to begin getting back to my hobby or to collect anymore…until now that is. Opening an e-mail from Viz Media, I was immediately taken in by the artwork for the series; not to mention its use of the urban slang terminology for “Gangster”. Seems promising enough, but you cannot judge a book by its cover. Or can you? I got my hands on it to find out. Since this is the very first book into the series, I figure it would be better to give you a synopsis of the book verbatim to the description on the back of it. I believe it will give you the best look at what the book is about. “In the city of Ergastulum, a shady ville filled with made men and petty thieves, whores on the make and cops on the take, there are some deeds too dirty for even its jaded inhabitants to touch. Enter the “Handymen,” Nic and Worick, who take care of the jobs no one else will handle. Until the day when a cop they know on the force requests their help in taking down a new gang muscling in on the territory of a top Mafia family. It seems like business (and mayhem) as usual, but the Handymen are about to find that this job is a lot more than they bargained for”. First off, it should be noted that the “GANGSTA” manga contains five chapters, with the last one starting on page 155 in book 1. It seems as though this book is aimed to introduce the main protagonists and a brief show of their personalities, skill sets, and mannerisms; set a stage for the main antagonists and conflicting interests; and a clear view of this gritty, no-holds-barred world infested with crooked police and general crime syndicates by displaying secondary characters’ reactions to their general environment, and towards other individuals (including our protagonists). Right from the first two pages before the first chapter even begins, we are painted a very grim picture of the harsh reality within the city of Ergastulum; a woman thrown to the ground because she did not bring in enough money with her prostitution, a clear warning for it not to happen again. 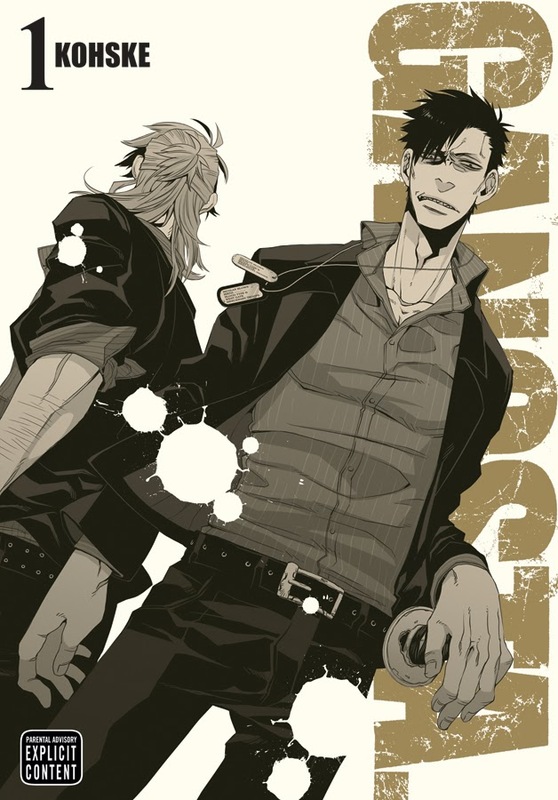 The pacing of this manga is good, they immediately jump us into the action of the main protagonists and we see why Nicolas Brown and Worick Arcangelo are known as “The Handymen”, seemingly doing any job for money no matter how dirty (or sleazy) it might be. Kohske also does a very good job with balancing out story driven scenes (such as introducing a currently faceless antagonist) and personal background ones (such as flashbacks to Nic’s past). It becomes evident that the reason that Nic and Worick are so adept at fighting is probably due to their troubled pasts. This ties in with their line of work and presents questions as more information is released; especially with the people they know (some shady characters), their sometime serious demeanor in contrasts to their often humorous take on things, and the cryptic images presented of their pasts. Dialogue is also good as well. They tend to speak more realistically than I see in a lot of manga. They use expletives, but how I expect them to be actually used (during really intense moments or to stress a strong point). They do not go into overkill with jokes, nor do they fire off a million f-bombs when things are not going right. In fact, the dialogue is so good I found myself reading it at the same pace I would probably read a subtitled anime, it was that good. However, as it is the first book, I cannot really say too much in regards to whether the plot is good or not because there is simply not enough information to be able to decide that yet. They do manage to peek your interest with flashbacks of characters and how they handle themselves. I will say this chapter is more on giving a look into the characters and merely stating at the end of the book “Expect further conflict”, and they if that was their mission, they succeeded. This is where GANGSTA shined as the two main characters, Worick and Nic, are supremely interesting right from the beginning. 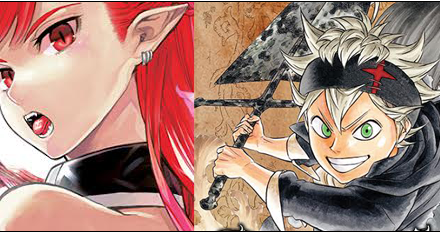 Having good leading men is ideal if you want to get the reader hooked, especially if they have some eccentric appeal that is not found within your typical manga. Worick is an eye-patch wearing, gun toting, womanizing smart mouth; while Nic is the silent, sadistic, tough-guy-with-a-heart-of-gold type. The book presents them at the very start kicking asses and collecting money for doing so, even has Nic taking the wallets from the guys they have knocked out and showing it off like he’s found the jackpot. On a serious note, the two characters diverse personalities are what makes this book incredible (Nic is my favorite of the two), their meshing despite their differences (As you can tell by information given at the back of the book, but we will get to that later). They both tend to joke around, but they also have their serious sides; and they are also presented as people who take pleasure in killing for money, but then they also show them loving and loyal. Multi-tiered personas bring them to life by us realizing the complexity of their behaviors and how broken they may actually be underneath what is shown to others. Appearances may only give way to facades which cloak deep burdens beneath them, that appears to be the case with these two. Character development applies to the protagonists, but also to some of the secondary characters. Such as one character that immediately becomes part of the “Handymen’s” circle had lonely, dead eyes without a purpose when they are first introduced. However, they soon come into their own and they are given new purpose and their emotions display that vividly. Even with antagonists, you can see easily the fear, pain, cockiness, so much is displayed in a very short period of time that really makes the story believable; but that may be more akin to the art style, but it completely works with what Kohske is trying to sell. While we did not gaze too much into what made them the way they are, the seeds have been sewn that I am genuinely interested in what triggered their take on life into existence. How can you turn around and kill someone you do not know in cold blood, yet at the same time save someone from a life of uncertainty? How can you laugh at the face of a man experiencing his final moments alive, but have such an air of melancholy for someone who does not have much of their time left? It is character quirks like this that baffles me to learn more. Not going to lie, I was very worried at first. I thought GANGSTA was going to do the “Ikki-Tousen” one-trick-pony thing with the art (Ikki-Tousen had repeated scenes featuring nearly the same kick with different people fighting in the first book) as Nic on the cover and Barry on the bottom-left panel of page 1 looked the same with different hair colors. However, this was merely a coincidence it seemed as that did not happen again (thankfully). 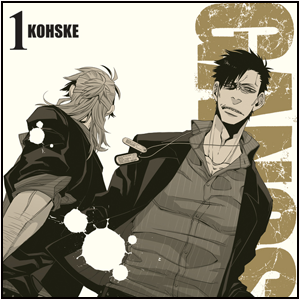 I actually really enjoy the gritty look presented in GANGSTA, as it is more of a “realistic” anime-style as opposed to a lot of the stuff you would find in mainstream manga; I would say it reminds me more of korean-style “manwha” instead. The main thing about her art-style is the expressions she is able to relate so cleanly about the characters, that and Kohske’s ability to draw hands very well. As far as the expressions though, a look of melancholy, rage, happiness, and even complete fear are done well and I feel that the story moves along brilliantly because how the characters feel is explained so well to the reader through image alone. Acting in movies are often judged by their facial expressions the most because that is what we tend to focus on, and GANGSTA has one of the best styles I have seen to date for detailing them. Something else I would like in the differing speech bubbles for Nicolas. Nicolas is deaf, and he talks with inverted speech bubbles (black boxes with white lettering), when he is using hand signals as opposed to actually talking (which is pretty broken since he is unable to hear himself). This is a great way to demonstrate his way of communicating is different than everyone else’s. Something to be noted is that backgrounds are drawn seldom in full detail, you are given a lot of white space and maybe a couple of things but they are often simple and not elaborate. Simply from the style of characters that are drawn and the emphasis placed on their facial characteristics, I think a simple background (or even white) is better to amplify their expressions. While you could call less complex scenery a bad thing, it is moot because it works in Kohske’s favor by drawing more attention to her characters. STRENGTHS – Interesting characters, Good facial expressions, Good story pacing, Good cliffhanger. WEAKNESSES – Lack of complexity in background art. Honestly, I am surprised that I like this manga so much, as I am normally very VERY picky. Even one of my most cherished manga “Real Bout High School” did not receive a recommendation on the account of too many things being wrong with it, even from the beginning of the very first book. On the flip side, it feels like GANGSTA is doing everything right, even from the very start. I am interested to see where they will be going from this point on, how the story will develop, and exactly what caused Nicolas and Worick to be who they are today. Even more so, I am wondering who the main antagonists will be if they are opposing a top mafia family. 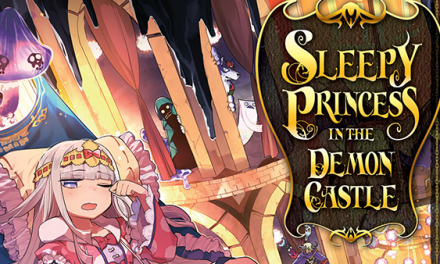 While this has everything I love so far (good art, gripping characters, cute girl, etc.) I am fearful it will become lost in itself like so many other great manga I have enjoyed. For now, it starts off very good and I recommend anyone to check out this first chapter. RWBY OFFICIAL MANGA ANTHOLOGY “Red Like Roses” Announced!